I kind of can’t believe that I haven’t shared this recipe yet. It’s one of our family favorites. I love making this for company too because everyone seems to love it, it goes a long way, and it’s healthy (without being completely obvious to guests). I mean, who doesn’t love a classic chicken pot pie?! 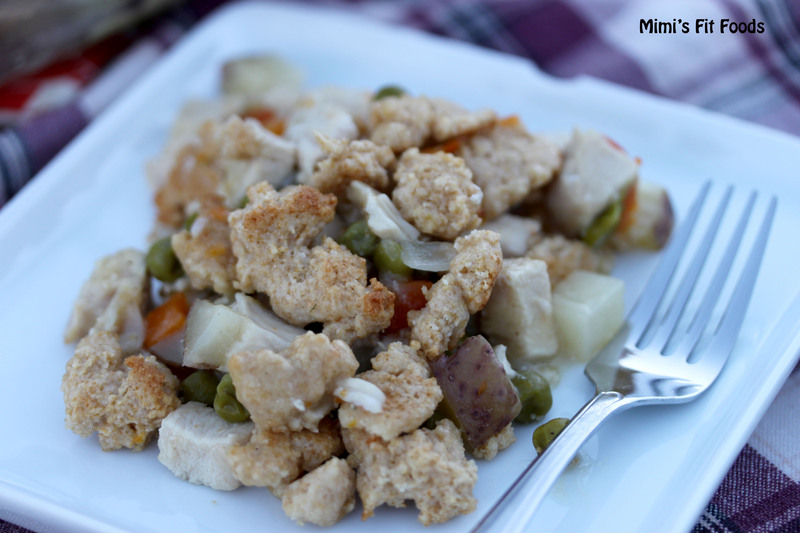 This healthier chicken pot pie is so fantastic because we are able to cut calories by cutting out the traditional crust. And, to be completely honest, I totally prefer this crumble biscuit topping anyway! I had you at “crumble,” didn’t I? It is everything that a crumble topping should be. It requires one extra step, but it’s WAY worth it (and you can skip it if you really don’t care). You partially bake the crumble separately from the filling, then scatter it over the top and slide it back in the oven to finish baking. This increases the crunch factor (no soggy topping). This can be stretched to 6 servings if desired (making each serving 264 calories). It can easily be doubled to go in a 9×13 pan as well. I do this quite often when I have people over or when I am taking a meal into somebody. It’s pretty awesome, tasty, and comforting. Enjoy! P.S. This is a great use for leftover turkey. Since the holidays are coming and you just might be left with some leftover turkey meat, you may want to consider using it in this recipe. In a large bowl, thoroughly combine all ingredients for filling. Transfer filling mixture to slow cooker (before filling slow cooker, I usually spray it with cooking spray to make cleanup a little easier). Cook on low for 6 hours or on high for 3 hours. Towards the end of cooking time, preheat oven to 450 degrees and make biscuit topping. Combine sugar, salt, baking powder, and wheat flour in a small mixing bowl. Stir with a fork to combine. Add milk and oil and gently stir with a fork until combined. Drop pieces of dough (crumble the dough into irregularly shaped pieces that are roughly the same size) on a greased or parchment-lined rimmed baking sheet (I line a jelly roll pan with a silicone baking mat). Bake for 6 minutes (crumbles will barely be getting brown). Remove from oven. While crumble topping starts baking, gently stir filling mixture to evenly distribute heat. Transfer mixture to an 8×8 baking dish (this can easily be doubled to fit a 9×13 baking dish). 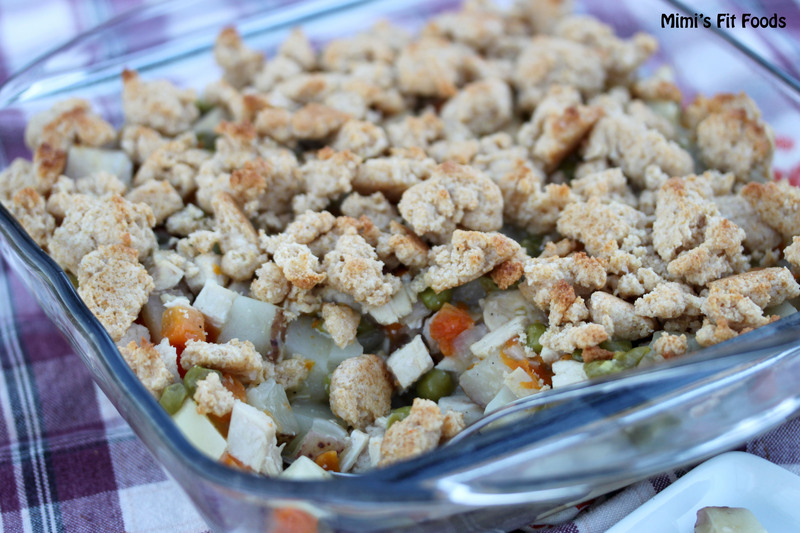 Once crumble topping is removed from oven scatter it evenly over top of filling. Place in a 450-degree oven and bake an additional 6 minutes or until crumble topping is golden brown.